Does anyone else miss wearing layers? I'm talking layered shirts, cardigans and jackets. During the summer months, I miss layering. I spotted Kendi wearing this trend earlier in the summer and just loved it. My dilemma was that the denim jacket I owned was one I loved and wasn't ready to part with it. So, I kept an eye out for a denim jacket that fit me and could become a vest. 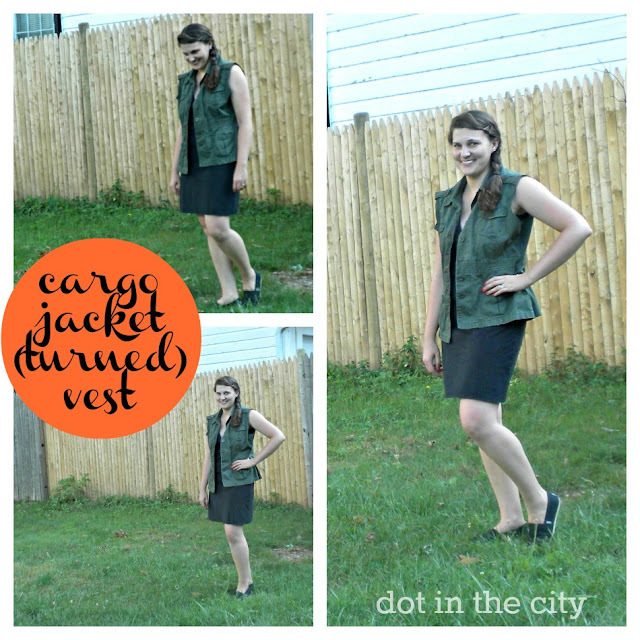 Once I saw Anna's DIY denim cargo vest and I remembered a jacket already in my closet. I had bought it at a consignment shop in the spring for about $5, but the sleeves weren't the right length. The cargo jacket was my first vest of the summer and a few weeks later a friend found a nice denim jacket at Goodwill for me. I have to say, they are my cure for layers in summer! I really love wearing the cargo vest with a dress. It's a simple outfit, yet provides pockets. I love having pockets to keep my work keys and cell phone with me throughout the day. 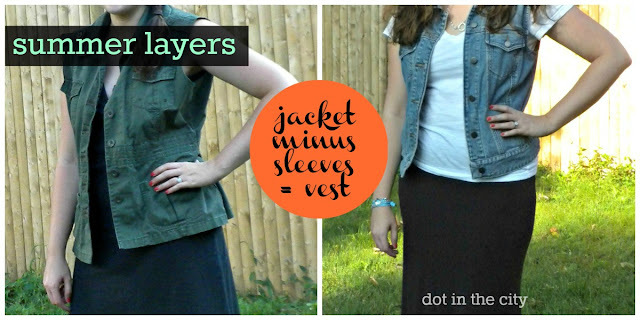 I know I'll get a lot of wear from this vest into the fall...more layers! The denim vest is fun an casual. The collar is a bit frayed, which doesn't matter since denim is considered pretty casual, at least in the Northeast. But I wanted to wear it to work, so I felt a skirt was necessary. I chose my most comfortable skirt and a plain white t-shirt. I think the denim vest will also look great with a maxi dress or khaki shorts for the weekend. A fun discovery about this jacket is that it has interior pockets, so I can still carry my cell phone and keys with me at work without looking like it has cargo pockets! I am grateful since fall is still over a month away and cooler temperatures won't be here for a while, to have found a cure for layering. I can't wait to put together more outfits using either vest, but I think the denim one is my favorite. I'm just a westerner at heart! What trends do you love to wear lately? ...don't forget to enter the giveaway from Petunia Blooms! OOOOO beth! i was on the fence about denim vests, but you have me convinced girl. LOVE THEM! and love this one on you! I would have to say I do and I dont miss it - I love the summer and the simplicity of just throwing anything on. But when its time to layer up, i do enjoy it. 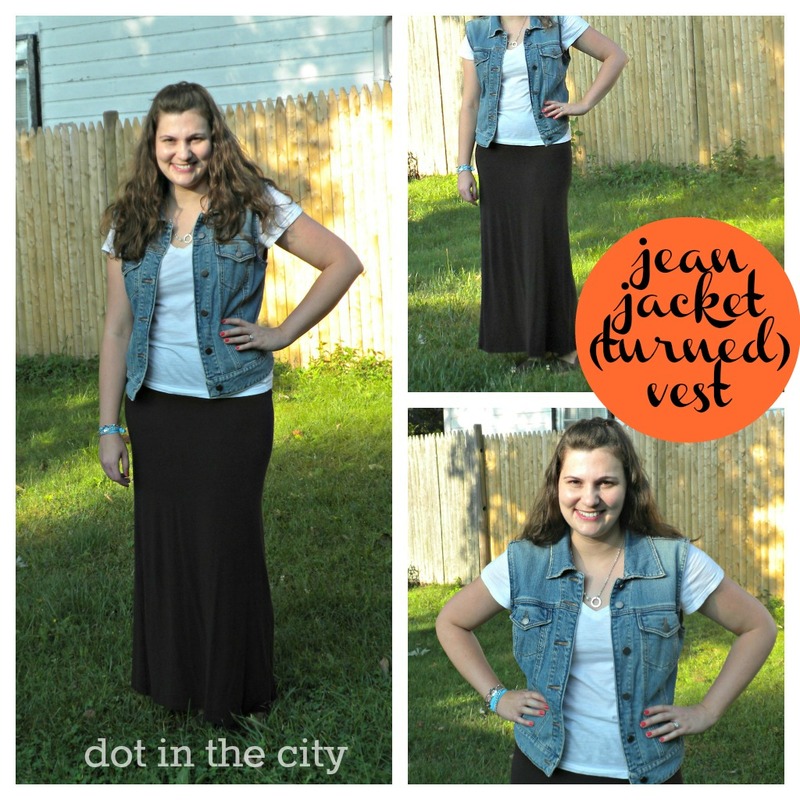 I love the jean jacket turned vest! totally love this girl! i have been thinking about doing it to a jean jacket too!